Who? The Great Horned Owl. It would be wise of you to start throwing the Great Horned Owl around the green. 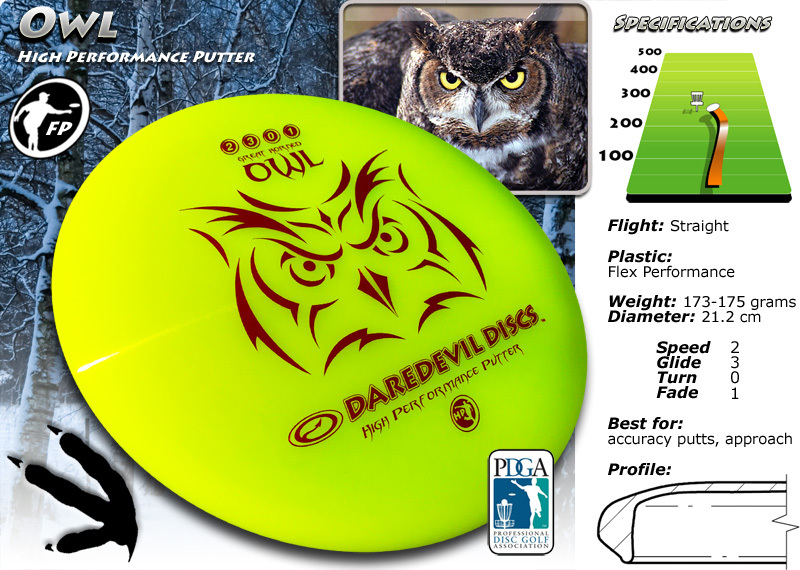 Dressed in High Performance Plastic and using Daredevil Discs’ popular and dependable putter mold, the Great Horned Owl comes to the course more rigid and fast. A stable putter, that brushes off the wind, it flies true and confident. Hunting the birdies you deserve. The great horned owl has no horns! It is named for the tufts of feathers that sit on top of its head, called plumicorns. Scientists don’t know why these owls sport the tufts, but they do have a few theories. The tufts might help members of their own species to recognize each other among the forest around them, or they may use the tufts to blend into their surroundings, making them look more like broken tree branches than a tasty meal. The great horned owl is one of the most common owls in North America, found in a range of habitats that includes forests, swamps, deserts, tundra edges, tropical rain forests, cities, suburbs, and parks. If you live in North America, there’s a good chance you’ve heard the deep, soft, stuttering hoots of this owl: hoo-h’HOO-hoo-hoo. This owl uses this hoot to advertise its territory. It can also make a variety of other sounds, including whistles, barks, shrieks, hisses, coos, and wavering cries. You are most likely to hear an owl hoot at night because they are nocturnal birds. They have big eyes and wide pupils that allow them to spot their prey. Unlike people’s eyes, their eyes don’t move in their sockets, but the owls can swivel their heads to look in any direction. Their short but wide wings allow them to fly through the forest, and their soft feathers help them approach prey very quietly.